For many of us, January signifies the end of another busy holiday season and the start of a new year. Whether we are looking ahead towards starting a new job, welcoming an addition to the family, embarking on travels or simply continuing on with life, 2015 is here to stay. However, for many couples who celebrated the holidays and New Year's Eve with the added joy, love and amazement of an engagement, this year is all about wedding planning! Dates, venues, vows, invitations, dresses, cakes, decorations... there is so much that goes into ensuring that the big day is as memorable and dream-filled as possible! But adding unique touches to the wedding day itself isn't the only way that couples can let both of their personalities shine. Your friends and family want to help start you off on your new life together, and there's no better way to let them do just that than by heading to your nearest Target to browse, sign up and fill your Target Wedding Registry! From home decor to games and electronics to items for entertaining (and everything in between), Target's wedding registry allows users to add anything from the store or Target.com to their wishlist. The possibilities are endless so why not start your new life together with all of the everyday essentials, necessities, splurges and things you'll both really use and love? But, along with the practicality, ease and convenience, registering at Target can also help unlock a whole world of unexpected experiences together! As couples prepare to embark on their joint life, any and all of the fantastic items from their Target Wedding registry can make it more fun and more meaningful. And, as much as traveling to exotic destinations and throwing lavish dinner parties are wonderful events, sometimes something more simple like dinner and date-night-in is going to make up the memories that you cherish most. ...or try something new! Why not look up a few recipes online or in your favorite cookbook that neither of you have tried before? You never know when your next attempt will turn into a jackpot dish that you both will love! And it would be even easier to finish off the meal by registering for an amazing KitchenAid Ultra Power 4.5 Qt Stand Mixer and a BakerEze Nonstick 10-pc. Baker's Basics Set so that it is a snap to whip up all sorts of sweet and savory desserts! Once you've got your luxurious dessert out of the oven, is there any better way to top off date-night-in than by cuddling up together on the couch to eat it while listening to some romantic music or watching a romantic film? 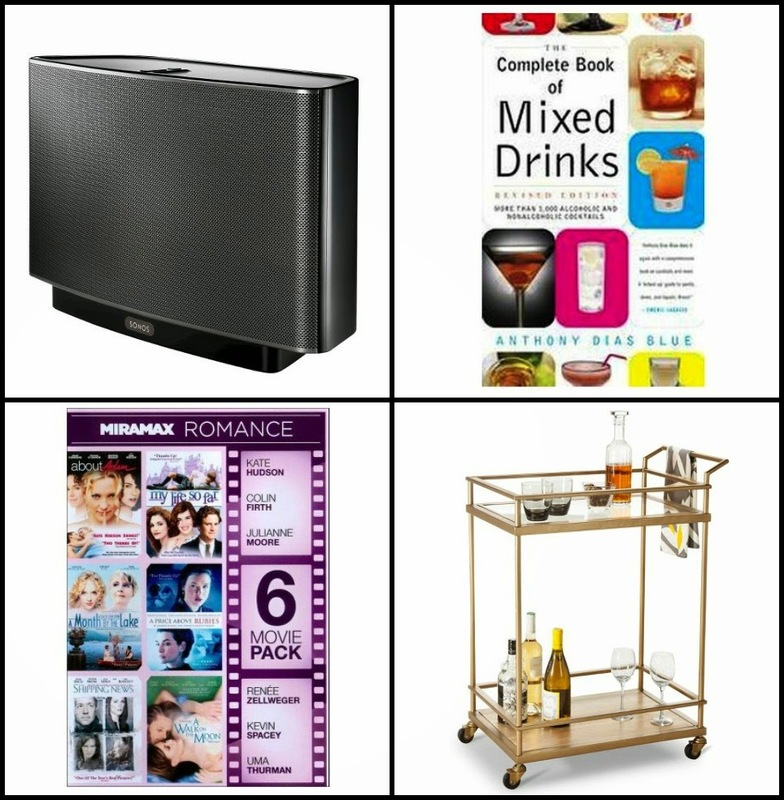 If you've received your SONOS PLAY: 5 Wireless HiFi System from your Target Wedding Registry, then all you need is to pull up your Threshold Bar Cart, Threshold Etched Glass Drinkware Collection and The Complete Book of Mixed Drinks and you're fully prepared for smooth sounds and extended cuddling. Or, to bring the love to the small screen, pop in any movie from the Miramax Romance: 6 Movie Pack and the night is complete! Now that we have kids, my husband and I don't have nearly as many date-night-in evenings as we used to, but I love being able to look back at our younger days and relish in the memories that we had cooking and spending time staying home enjoying each other's company (some meals turned out to be a hit and some were a burnt miss)! No matter what sort of adventures you have planned with your betrothed, be sure to keep a Target Wedding registry in mind so that your family and friends can help you experience life to the fullest. They make it possible to have an easy and engaging registry experience by providing inspirational starter lists; your guests can shop in-store or online; returns and exchanges are simple; and you even receive a 15% off completion offer so that after your wedding you can pick up any items left on your registry at a discount. If you or someone you know is planning their wedding, be sure to find out more about all of Target's Wedding Registry options by visiting Target.com or visiting your local Target store today! I think Target is a great place to have a registry. I shop there all the time, such great products. I agree that Target is a good place for a registry. Your friends and family can spend a little or a lot.